With audio networking an increasingly fundamental part of the professional sound industry, Yamaha is committed to keeping system designers and users updated with the latest developments. 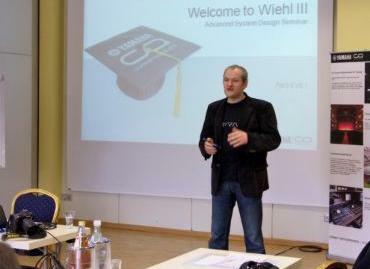 With that in mind, in mid-February the company invited 30 influential system designers from across Europe to a two-day seminar, where a comprehensive range of issues was discussed. Held in Wiehl, Germany, this was the third such event hosted by Yamaha over the past few years. Company staff who led the sessions were Ron Bakker, Ruben van der Goor, Arthur Koll, Andy Cooper, Max Ota and Pawel Zachanowic. Kai Koennecke and Jan Prins provided technical and logistical support, while the technical preparation was aided by Atsushi Kitagawa. The 30 leading designers who took part came from a number of European countries, including Austria, Germany, the Netherlands, Poland and Switzerland. The seminar used specially-constructed application setups which allowed for fully interactive learning. Featuring a range of Yamaha digital mixing consoles, amplifiers, SB168-ES stage boxes and third party interface cards, they allowed hands-on training with a range of different networks including ES100 (in a UNioN configuration), Optocore, CobraNet, Rocknet, Dante and SoundGrid. The event was divided into two sessions, with the headings Networks and Quality. The Networks session included an update on all networking developments since 2008; the conventions of Yamaha’s UNioN; multitrack recording and playback of audio over different networks; distributed DSP; audio, video and lighting control over IP and multiple access ES100 systems. Meanwhile the Quality session primarily featured the study of head amps, jitter and their effect on audio quality. The aim of the head amp presentation was to demystify a range of issues, explaining how remote controlled head amps are built and their associated quality issues, includ­ing circuit design, grounding, consistency, RF interference sensitivity, remote gain circuits and build quality. This was followed by a blind listening test of stage boxes from four different manufacturers, including Yamaha’s SB168-ES. Similarly, a theoretical explanation of level and timing errors caused by jitter was followed by another blind listening test. Both listening tests proved exactly what Yamaha’s technical team had expected - that the preamp quality of all the tested stage boxes was virtually identical and that jitter is extremely difficult to discern. Of course it wasn’t all work - much lively discussion took place over meals and a great deal of fun was had by both the delegates and the Yamaha staff at a bowling evening after the first day.